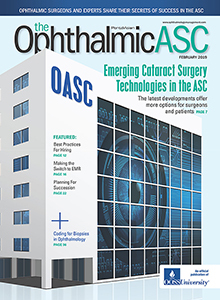 On September 24, OOSS joined the American Society of Cataract and Refractive Surgeons (ASCRS), the American Society of Retinal Specialists (ASRS) and the Society for Excellence in Eyecare (SEE) in submitting comments to the Centers for Medicare and Medicaid Services (CMS) regarding its proposed 2018 ASC payment regulation. For years, we have strenuously objected to CMS’ use of the Consumer Price Index (Urban) as the update factor for ASCs,CMS has seen the light and is proposing, as we have recommended for years, to adopt instead the Hospital Market Basket as the ASC annual update factor, which is typically about a point higher. We are also supporting CMS’ proposal to improve payment for procedures that encompass the use of expensive devices and implants. We continue to support a proposed ASC quality measure on TASS which was developed by the ASC Quality Collaboration (on whose Board OOSS sits). We recommended that CMS remove FDA-approved intracameral drugs that are used for pain and inflammation as a “covered service” within our facility fee and pay for them separately under Medicare Part B. We are urging CMS to continue to delay implementation of the OAS CAHPS patient experience/satisfaction survey until the instrument is shortened and there is an electronic compliance option. For more information, contact OOSS Washington Counsel, Michael Romansky, at mromansky@OOSS.org.